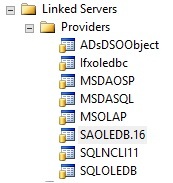 SQL Server – An invalid schema or catalog was specified for the provider SAOLEDB for linked server.. So you’ve installed the correct drivers, and set up the ODBC System DSN properly. Things are going smoothly! Then BAM! Silly errors everywhere! An invalid schema or catalog was specified for the provider "SAOLEDB.16" for linked server "REDACTED".